Even as I write up this post, the sun is barely peeking over the rooftops. I am snug on my porch with my coffee and laptop. My cat, Simon, peering enviously through the curtains at me, longing to be in the morning air, chasing birds and munching dewey blades of grass. 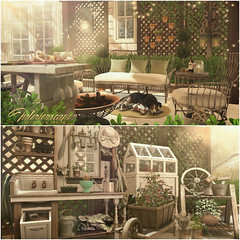 Appropriate then, that the name of the house I am featuring in this post, is The Victorian Sunrise Cottage from DaD Designs. This little gem of a house is available for a few more days at Shiny Shabby before it makes it’s way to the DaD Main-store. There are a few things that I really love about this home and I want to share those with you. Curb appeal gets a “10” from me. The porch is begging to be dressed up and adorned with bodies lazing in the shade. The detailed sections at the top of the porch remind me of the gingerbread lattices on the Victorian homes of the Mid-West. The architecture remains consistent throughout the home and the interiors are adorned with nicely aged textures that are not “overdone.” The scaling of this home is on the realistic size, which, I appreciate as a decorator. It is the perfect first or second home for many situations. Edit mode Cottage then – Select face to add your texture floor. The windows open by touch as the doors to the easy step. Check them out on Facebook to keep up with new releases and event happenings!